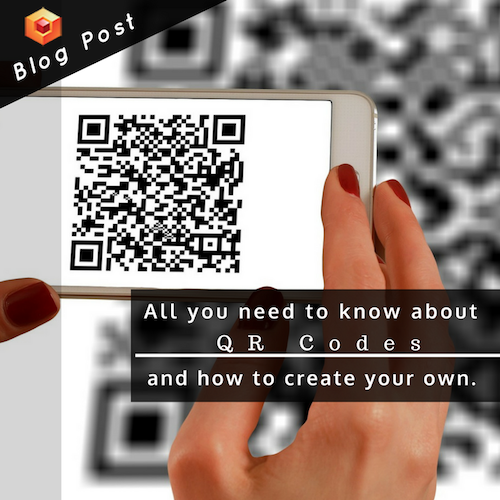 All you need to know about QR Codes and how to create your own. QR codes are starting to pop up everywhere. Recently many schools and institutions have started to use QR codes in order to increase the learning experience of young students. They might seem a bit complex at first but they are very easy to use and create. But first ... what is actually a QR Code and how does it work? QR stands for Quick Response and it is a matrix barcode that was created in order to support the rapid development of the automotive industry in Japan. The Barcode is an optical label that is readable by machines and that contains information about the item to which it is attached. The marketing of smartphones with QR Code-reading feature has facilitated the rapid growth of this trend. These phones enable their users to access a website by just scanning this strange, eye-catching pattern. The simple usage and convenience helped to increase the popularity of the code among the general public. And now, it is an indispensable tool for businesses and in people's daily lives. What are the additional benefits of a QR code? Conventional bar codes are only able to store maximum 20 digits. QR codes, on the other hand, can handle around hundred times more information. Up to 7089 characteristics can be encoded in one system. QR codes have an error correction capability meaning that data can be restored even if the symbol is dirty or damaged. QR codes can encode the same amount of data in approximately one-tenth the space of a traditional barcode. So ... how do I create one? Step 1: Find a QR code generator. If a generator allows you to design a code that is unique to your brand and if it is compatible with common QR code readers, you will be able to track and analyze your performance. QR codes are very easy to customize. You can design a code that looks like your company's logo or one that reflects the design scheme on your website. Ones you have decided with QR code generator you would like to use, you need to choose what type of content you want your QR code to send to the consumer. The most common one is the simple URL but you can also send out a different type of content such as emails, events and geolocations. Afterwards, you just need to insert your content and you can already see the preview of your new QR Code and download it. Easy, right? Don't forget to check to see if the QR code “reads” correctly. We suggest you try it out on more than just one reader. You can use the following two tools to check if it is working or not: QR Code Reader and Apple's Passbook. Last step: Track and analyze performance. By including a UTM tracking code on your URL you can measure your performance more effectively. This is quite useful for companies applying more in-depth reporting on their campaigns. Just like any marketing campaign, you need to follow up if QR codes are actually working and suitable to your audience. Not every audience is compelled enough to scan your QR code. Also, are your customers scanning the code but not redeeming their offer once they get to the landing page? Knowing this will help you adjust your QR in the future. Don't require a special QR code scanner. Your QR code should be app-agnostic so anyone can scan your code with any reader. Place your QR codes in places where scanning is easy, and there is enough time for the consumer to actually scan the code. QR codes on highway billboards and TV commercials are very cool but not user-friendly at all. Try to find a place and medium where your audience has time to scan the code, and, ideally, a Wi-Fi connection. Business Card with QR codes can be very effective for businesses. Create a QR code for your (PowerPoint) presentation so you don't have to send it via email to everyone who wants to have a look at your slides. This way everyone who is interested in your content can just scan the QR code and automatically have the whole presentation of their phone. You want to find out more about QR codes or you are not sure how to incorporate it into your business? Write a comment below or contact us directly via Facebook or e-mail.